Recommended throughput of 400 lb/hr with 600 lb/hr maximum. Temptek VL Series Vacuum Loaders provide self-contained vacuum transfer of plastics pellets and regrinds over short distances using powerful single-phase vacuum motors. Standard models are made for flange moutning to existing bins or hoppers. Micro PLC based control with complete programming and monitoring capabilities, graphic faceplate displaying parameter value codes and providing step-by-step programming instructions. The control can be remotely located at operator level. Recommended (max) Thoughput / Hr. 1. All models with standard 2 lb. capacity glass : add 3" to Dimension A above. 2. Resin capacity and throughput based on 38 lb./ft3 bulk density. 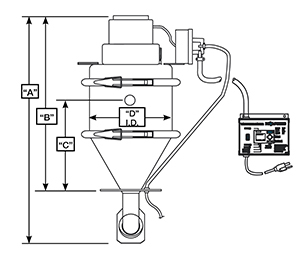 Adding external proportioning valve reduces throughput. 3. Max rate based on use with 10' (ft) flex hose. Recommended average rates produce optimal use and life expectancy, exceeding the maximum recommended rates will shorten motor and brush life. 4. Horizontal distance based on transporting virgin resin through tubing. Vertical travel, bends and flex hose will reduce conveying distance. 5. See Product Warranty Statement for details on warranty. Reinforced filter disc has polyester layer to trap fines and rigid metal backing to extend filter life. Compressed-air blowback reduces filter clogging for less maintenance. Includes 15 ft. (4.6 m) length of flex hose, pickup wand and hose clamps. All material contact points are now-ferrous. Dump Valve with integrated demand level switch on standard models. Inlet Diameter : 1.5" O.D. One Year warranty (Excludes normal maintenance items). Complete programming and monitoring capabilities. Graphic faceplate displays parameter value codes and provides step-by-step programming instructions. Can be remotely located at operator level.